6 Bedroom Detached House For Sale in Horsham for Guide Price £1,500,000. 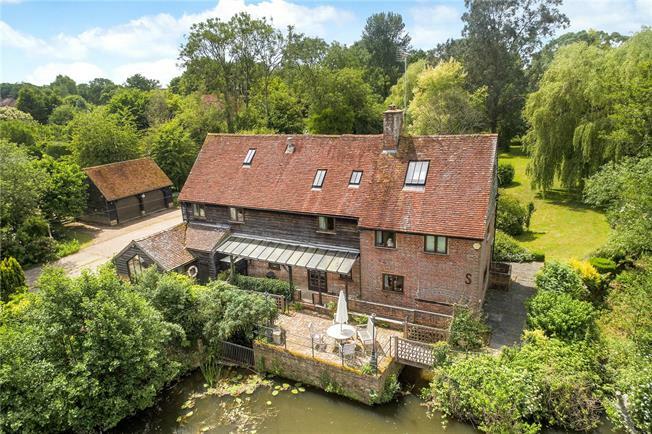 WATERSIDE - Wanford Mill is a delightful former water mill listed as being of 16th century origin with elevations of brick, part weather boarded under a tiled roof. The property was a working mill until shortly before the Second World War and was then converted to a private dwelling. The conversion has created a home of considerable character and comfort with all rooms enjoying delightful views over the Mill pond, river and open pastureland beyond. Throughout the rooms are well proportioned with good ceiling heights and many features including exposed timbers, traditional Sussex oak door latches and parts of the original workings of the mill have been retained. On the ground floor is a spacious entrance hall; cloakroom; fitted kitchen/breakfast room with solid oak units, built in appliances and a mains gas fired Aga; dining room and a triple aspect sitting room with a wood burning stove. On the first floor there are 4 bedrooms, shower room and bathroom including a triple aspect master suite and above are 2 further bedrooms, bathroom and a study. Set within the grounds there is a detached period barn which has recently been extensively refurbished and offers excellent ancillary facilities for the Mill House. The barn provides guest/additional family accommodation comprising a spacious open plan vaulted reception room with a large south facing picture window, a well appointed kitchen, shower and utility rooms on the ground floor and a bedroom and store rooms above. Wanford Mill is situated in a beautiful rural setting on the edge of the hamlet of Bucks Green and less than one mile to the south of the village of Rudgwick which provides local amenities including shops, doctor, dentist, village inn and church. The property is set amidst beautiful countryside, a short distance from the Surrey/West Sussex border. The villages of Cranleigh and Billingshurst are each within 5 miles and provide excellent facilities whilst the larger centres of Horsham and Guildford are about 7 miles and 14 miles respectively. From Horsham there is a main line rail service to London Victoria (from 52 minutes) and from Guildford to London Waterloo (from 37 minutes). There are excellent sporting and recreational facilities in the area including golf at The West Sussex (near Pulborough), The West Surrey (near Milford), Wildwood (Alfold), Slinfold, Cranleigh and Rookwood (Horsham), racing at Goodwood and Polo at Hurtwood Park and Cowdray Park. Over the surrounding countryside there are many miles of beautiful walks and rides including the nearby Downs Link bridleway. Within a short distance there are excellent schools including village schools, Pennthorpe (Rudgwick), Farlington, Cranleigh, St. Catherine’s (Bramley) and Charterhouse at Godalming. From the Haven Road a long private drive passes Wanford House and then continues through double five bar gates to a parking area adjacent to the front entrance of Wanford Mill. The Mill is set well within its land and lying to the south is a secluded mature formal garden with areas of lawn, deep well stocked herbaceous beds and a variety of established flowering shrubs and fruit trees. Within the garden there is a pergola with climbing shrubs, an Italian-style fountain and a vine. To one side is a greenhouse with adjoining cold frames and a fruit cage and to the other side a range of timber stables/storage comprising 2 stables and a tack room. Adjoining the Mill House there is a brick terrace creating a delightful entertaining area overlooking the river with the benefit of fishing rights. The mill race extends under the Mill House opening into a large mill pond and then into the leat beyond. Between the mill pond and the river there is a large area of lawn extending from the Mill House and forming an island which is inset with a number of fine mature trees and leading to an open area of pasture with a field shelter to one side. In all the gardens and grounds extend to about 2.4 acres. Included in the sale are detailed plans from a specialist company for the installation of a hydro-electric generator with the potential to produce some 15kW continuously and correspondingly, significant revenue generation.